At Parlor salon, our guests become our friends. We like to be personable and we work hard to make every appointment relaxing and enjoyable. Come experience our exceptionally caring stylists. 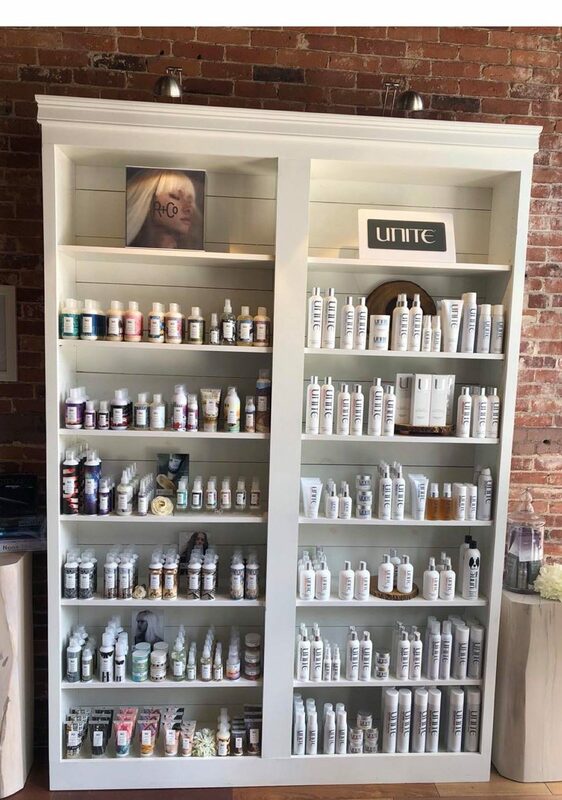 -Heather Dragon – Owner / Stylist: Heather has been in the hair industry for over 17 years, and has always had a strong vision for opening her own salon. She wanted to create a relaxing environment for guests to enjoy. Her dream came true in August 2017 when opening Parlor salon. She fell in love with the open space and was inspired by the industrial look of the exposed brick and wanted to incorporate a clean, fresh, modern feel with lots of white tones. Heather is drawn to soft, natural, lived-in hair and is passionate about creating a look for each of her guests that leaves them feeling refreshed and confident. Her focus is to keep up with the growing trends and techniques, and loves to attend hair shows traveling to Boston, New York City, Rhode Island and Las Vegas. She is certified in Hot Heads tape-in hair extensions and SHE SoCap hair extensions. Heather is also certified (11 years) in keratin smoothing treatments. Heather specializes in blonding, babylights, balayage, and keratin treatments, and she understands the importance of keeping the integrity of the hair healthy throughout any service using b3 BRAZILIAN BOND BUILDER. -Jillian McDonnell – Stylist & Lash Artist: Jillian has been cutting, coloring and styling hair for over 10 years. She has taken many training courses on modern color techniques, to enhance her professional skills such as balayage, precision cutting and HotHeads tape-in extensions. Jillian specializes in cutting curly hair and creating a gorgeous, even-textured shape. She has always had a passion for making people feel beautiful and strives to have her guests leave with natural looking hair and enjoys giving them an easy to style, everyday livable haircut. Jillian has a passion for not only hair but for lash extensions! Since she had her first full set of lashes years ago, she decided to make it a part of her menu. With training in classic, hybrid and volume lashes, she excels with extending your natural lashes whether it is to accentuate natural lashes or to make lashes voluminous, full and stunning! -Ryann Frank – Stylist: Ryann loves all things hair! Growing up struggling with self confidence has given her the gift of showing other women how beautiful they are. She enjoys updos, although color is her true passion. Ryann’s favorite services include balayage, corrective color, and vivid shades as it presents her with a challenge behind the chair. In addition, she loves building lasting relationships with clients by providing excellent customer service and reflective listening skills. Being able to educate clients and show them how to achieve the salon style at home is the ultimate goal. -Kaitlyn Minakin -Stylist: Bio coming soon! -Gabrielle Gould – Stylist: Gaby followed her dream of becoming a stylist. She enjoys balayage, all over color refreshes, and highlighting to give you that textured, beachy feel. If you are looking for a striking blow out for that special occasion, or just to make you feel pampered, your expectations will be exceeded! Gaby loves attending trainings, hair shows and is always learning new and trendy techniques. She will greet you with a smile when you walk through the door. -Tina Wright – Stylist: Tina has over 20 years in the industry. Tina’s creative intuition, passion for industry education, and true dedication to her clients keeps her in high demand. Tina prides herself in her work and more importantly her client focus. She is very skilled with precision cutting, textured hair shaping and creating a beautiful custom color. -Caitlin Magnon – Stylist: Picture and bio coming soon! If you are looking for an appointment and don’t see the time available with your stylist please call the salon 603-715-9012.